Sixteen-year-old climate activist Xiuhtezcatl Martinez and his group the Earth Guardians believe that choices made now will have a lasting impact on the world of tomorrow, and they want to ensure a positive, just, and sustainable future. Beginning with their empowering story, We Rise explores many aspects of effective activism and provides step-by-step information on how to start and join solution-oriented movements. 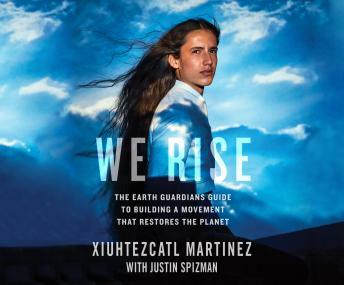 With conversations between Xiuhtezcatl and well-known activists, revolutionaries, and celebrities, practical advice for living a more sustainable lifestyle, and ideas and tools for building resilient communities, We Rise is an action guide for how to face the biggest problems of today. If you are interested in creating real and tangible change, We Rise will give you the inspiration and information you need to do your part in making the world a better place.